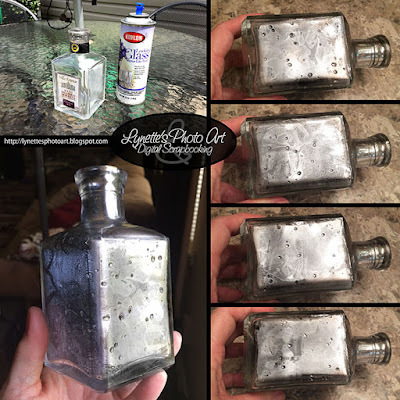 DIY Mercury Glass Most Awesome! We've all been making our own faux mercury glass for quite a while now, but this one turned out sooooo cool that I had to share! I like unusually shaped glass containers. I wash, remove labels and save them. They are useful for lots of things like vignettes, tablescapes, vases and of course to store left overs in! I had bought this balsamic vinegar at Home Goods because I loved the shape of the bottle and the very snug fitting plug. I used the last of it the other day and washed it out as best I could without a bottle brush. I had thought to put flowers in it, but today I had another thought...I do like mercury glass and I had some Krylon Looking Glass spray paint left over from another project. You are to apply several light coats of the paint. I was surprised that a spray inside only resulted in liquid rolling around this time. I kept turning the bottle to "coat" it, but it just wasn't sticking. Unusual "bubbles" and patterns started appearing as I'd keep it moving to spread the paint, blowing into it occasionally to encourage drying. It was so strange that it wouldn't really stick! Then it hit me - I had not successfully cleaned all the balsamic vinegar out of it! The film that remained was resisting the paint attaching! It took a lot longer than normal, but I kept spraying some in, moving it and blowing into it occasionally until no liquid moved any more, then spraying again. Really cool patterns developed. Yeah! After all, the method to make it faux mercury glass and not just a mirror look requires us to do a technique with vinegar on tissue and dabbing. I was not going to be able to do that in this narrow necked container. As it turned out, IT was doing it for me and so much cooler than I would have done! I opted to stop before it was fully opaque because it looks really cool. Even fully dry all the bubbles and patterns stayed. I wiped a bit of nail polish remover over the opening to easily remove the paint that was on the lip. I love the end result! And what's the lesson I learned from this project? That NOT getting my dishes clean can be a good thing sometimes! I might just start swishing the thicker balsamic vinegar in my jars, then washing them lightly before making them into mercury glass from now on! Thanks for stopping by and have a fantastic day!